The whole shared-universe thing isn’t such a shocker, not only because of Dan Akyroyd’s statements on the matter—Dan Akyroyd says a lot of things, after all—but because every intellectual property holder has MCU-level aspirations these days. As we reported yesterday, Brobusters (working title) star Channing Tatum’s real-life pal Chris Pratt may co-star in Ghostbusters’s return to male form after Paul Feig’s all-female movie, which, again, shouldn‘t come as a surprise considering Chris Pratt is supposed to star in approximately half the movies coming out in the next five years. After that, the two teams will apparently commingle, Avengers-style, ignoring Spengler’s advice to never cross the streams. After that? Chaos. 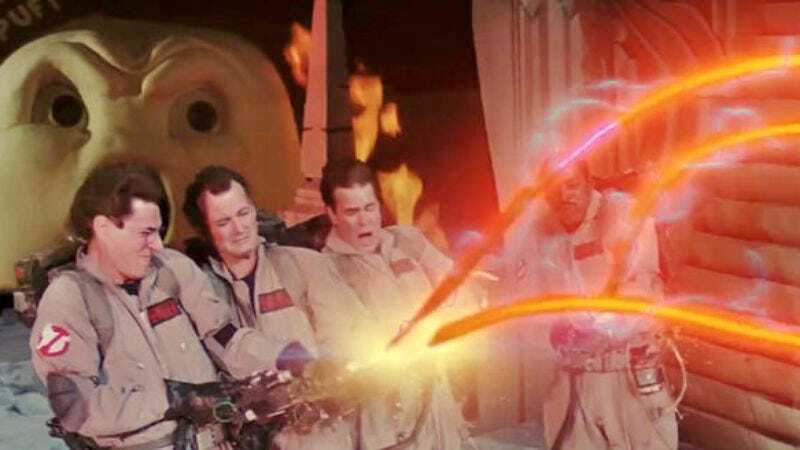 “I think the key here is that while it’s the Ghostbusters universe, not every movie has to be about people busting ghosts,” Faraci says, suggesting that just about anything funny with ghosts in it could very well be called a Ghostbusters movie now. So expect a series of prequels chronicling Venkman, Stantz, and Spengler’s college years, featuring a cameo from a pre-death Slimer as a Boss Hogg-type fat Southern colonel. We assume, anyway.